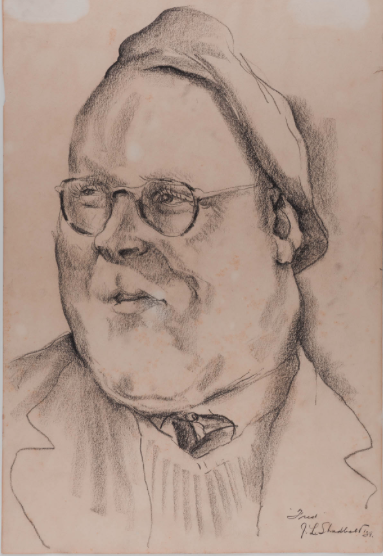 Portrait of Fred Amess By Jack Shadbolt. Image courtesy of the Morris & Helen Belkin Gallery, UBC. Fred Amess was born near London, England on April 7, 1909 and moved to Canada with his family, arriving on the West Coast in 1913. Fred was in the first class at the Vancouver School of Decorative and Applied Arts when it opened in 1925, and was in its first graduating class in 1929. After graduation, in 1931, Amess joined the faculty as the Evening School Supervisor at the art school. He stayed at the school nearly 40 years, serving as its principal from 1952 to 1970, taking over after Charles H. Scott retired. Amess was an advocate of the Art in Living group, and exhibited at the Art Gallery of Greater Victoria, Vancouver Art Gallery (1950 and 1951), and the Bau-Xi Gallery. He also showed work at the National Gallery, Ottawa, and at the Seattle Art Museum. He exhibited work with the B.C. Society of Fine Arts and won two awards of merit for his work. Amess died in North Vancouver December 31, 1970, aged 60.